Additional Info: Pianist Li-Ying Chang graduated with a Master's of Music in Piano Performance from the Peabody Conservatory of Johns Hopkins University, under the tutelage of Benjamin Pasternack. As a musician, Li-Ying seeks to share the transcendent experience of music with others as a solo and collaborating artist. She graduates as a Performance Diploma at the Chicago College of Performing Arts at Roosevelt University, in the studio of Meng-Chieh Liu and Dr. Winston Choi. Li-Ying is a previous winner of the CCPA Showcase at Roosevelt, and played the opening concert at Pianofest 2013. Li-Ying was chosen to collaborate with the CCPA Wind Ensemble for an annual performance at Ganz Hall in 2013. Ms. Chang played the piano with CCPA's Chamber Orchestra as they recorded Thunderwalker, composed by Stacy Garrop, for Cedille Records. 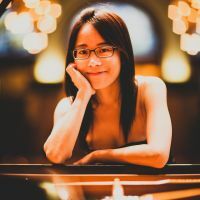 Ms. Chang actively performs as a solo pianist and chamber musician in the Chicagoland area and is a teaching instructor at the Chicago School of Music, Skinner North classical school, Old Town School of folk music as well as private teaching at her home studio at the Lakeview area. *30 to 50 per hour for rehearsal. (price varied according to pieces) 80 to 150 for recitals. *I have rehearsal space in my piano teaching studio, located near the CTA Brown line Paulina stop, at Roscoe Village.